Frugal and Thankful: Welcoming 2014 and starting a No-low Spend challenge. 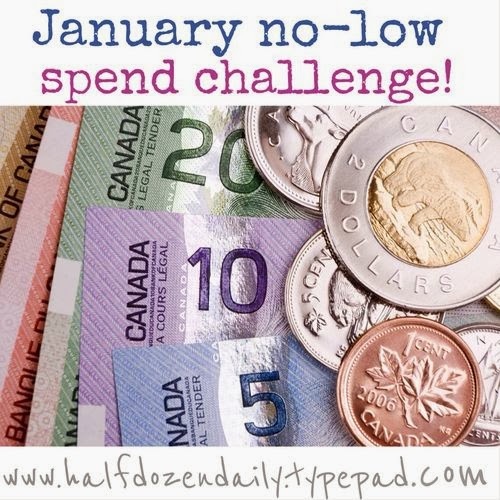 Welcoming 2014 and starting a No-low Spend challenge. Happy New Year, everyone!! May this year be full of love, excitement and successes for you! I was really looking forward to the beginning of this new year. The 2013 was not very nice to us. So many things have happened. Some I told you about, others - didn't. Some were not mine to tell... Or maybe, I was just too tired of complaining. Just writing this makes me too emotional. But hey, we are all together, have a roof over our head and food on the table, jobs we like, many blessings in life - life is beautiful!! By the end of the month I would love for us to save at least $500. Obviously, everything medical or work related will be an exclusion from this challenge. I also have two more exclusions but I will tell you about it a little later :) But for that we already have some money set aside. I'm excited for this challenge. It will be a good start to the New Year! Do you have any goals/resolutions that you want to achieve in the next 12 months? Happy New Year to you and your family. I'm sure you can manage this first challenge because when you break it down, it's only three days each week you need to avoid the shops. You can do it. When we do our grocery shopping we buy extra bread and milk and freeze it so that we don't have to "just nip out" for more and pick up other bits at the same time. Could this work for you? I try to do it too :) I think, it's very doable. I just need to keep track of what I already have on hand and substitute one things for another. Good luck with your goal of saving money towards your ER bill. I'm glad your son is better. Hi Lena - like you I just want to take 2014 one month, maybe one week, at a time. Things happened that knocked me sideways so I'm not hoping for too much, just calm and peace of mind. Let's hope 2014 doesn't throw too many nasty surprises at us! Oh, Jane, I really hope you have an amazing year ahead! Hugs!! You have shown such courage and grace with all your family faced in 2013. Thank you for being such an inspiration to the rest of us. Good luck in 2014. BTW, most hospitals will give a self pay discount as well as let you make payments at 0% interest. Oh, thank you, Debby :) You are so sweet! We already got a 40% discount but we are still waiting for the actual number so we can try to negotiate it even further.